College football began play yesterday and the Sports Techie community blog chatted about the Adobe Digital Index (ADI) most social fan followed teams list, stats and insights with Joe Martin, Senior Analyst, Adobe Digital Index. 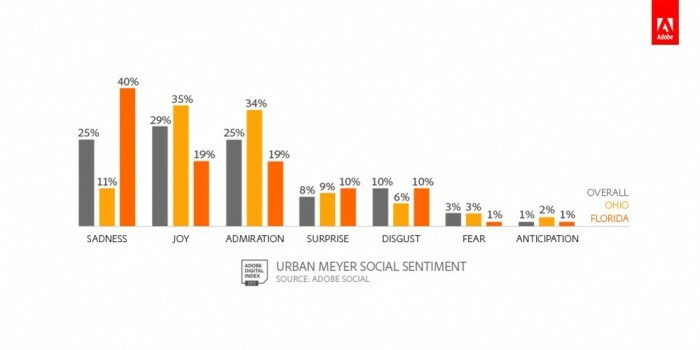 Each online cheer or boo for a favorite team, coach and player is measured in this season’s preview as social engagement Big Data. Martin discussed Adobe Social calculations and the number of mentions, page likes, followers, and positive sentiment generated by blogs such as ours, and on Facebook, Twitter and Instagram, along with other high traffic, popular and niche social platforms. Fans, university administrators and sponsors can learn more about the 2015 college football season metrics in our deep dive look below and read about last year’s top social buzz report analysis listing the NFL at the top. Martin believes that passionate social buzz among fans often leads to increased sales and development of a lifetime of brand loyalty for CMO professionals. Martin used ADI to capture and analyze 50 million social engagements related to college football and social fans from June to August, produced by the Power 5 NCAA conferences (ACC, Big 10, Big 12, Pac-12, SEC) and Notre Dame. He collected social buzz data from Facebook, Twitter, Google+, Reddit, Dailymotion, Flickr, Instagram, Tumblr, VK, Disqus, Foursquare, Metacafe, WordPress, and YouTube. 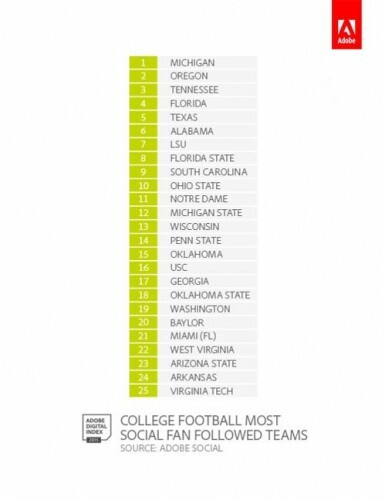 ADI research indicated that of the top 25 football teams, seven of the most socially engaged team fan bases hail from the SEC Conference. The Pac-12 boasted the highest average mentions per team (over 44,000), and the conference tied with the Big 10 for the broadest international reach at 8%. Both conferences trail the NFL’s international buzz. Conference traditions and continued success at the Oregon (2), Tennessee (3), Alabama (6) and South Carolina (9) programs are further stoked by the absence of a professional football team. USC and UCLA are in Los Angeles which is currently trying to secure one or two NFL franchises meaning this could impact the Trojans and Bruins social following buzz negatively should it happen. I asked Martin about the ACC social buzz as a whole because the conference produced the most first round NFL draft picks this year. He felt because they are now up to 14 teams, they fall to third on the list of average team mentions. Florida State is ranked number 8 but has a ways to go with converting their fans into the best social following group but Martin added that Miami and FSU certainly crank out NFL talent. 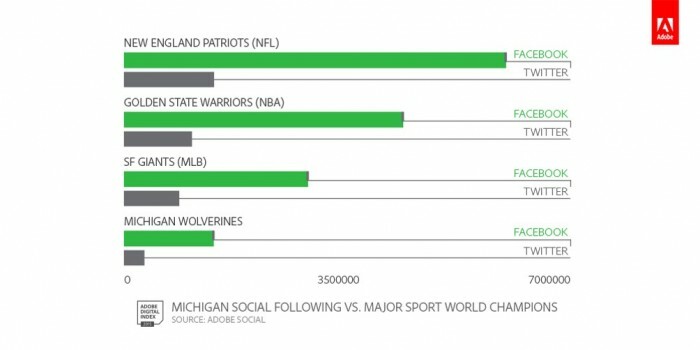 The University of Michigan Wolverines football team has the biggest social fandom and socially engaged fans at over 1.7 million (including Facebook) and is ranked No. 1with more than 300,000 Twitter followers. 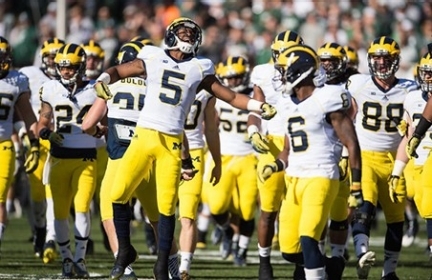 Top apparel marketers are paying a premium for college team sponsorship deals. Of all the regional football conferences, the Southeastern Conference (SEC) has the greater number of socially engaged fans. The Pacific-12 Conference (Pac-12), present in large domestic markets such as Los Angeles, generates the most international buzz and average team mentions. It was fascinating to find out from Martin that apparel companies like Nike, Under Armour, and Adidas purchase social-fan followings from college teams at a marketing premium compared with amounts paid for each fan of a professional sports team or player. He emphasized Nike’s average spend of $11.2 million a year in sponsorship dollars to the University of Michigan football team, equaling $6.50 for each of the team’s 1.7 million Twitter and Facebook followers. This may end up being a bargain amount for Nike if Michigan continues as the college football program with the most social buzz year-in and year-out going forward. Nike also pays around $30 million a year to NBA superstar LeBron James which equals to $0.67 for each of 45 million Twitter and Facebook followers. Yet, Nike and LeBron had over 200K social mentions together over the past 30 days while Nike and Michigan produced social mentions together in the 5,000 range over the same time period. 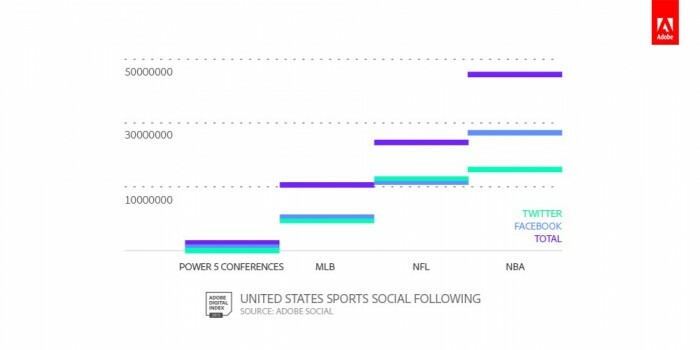 Social following in college football does lag behind the NBA and NFL but are closing in on MLB. Under Armour spends $9 million a year in sponsorship for Notre Dame football, which boils down to paying $12.50 for each of the team’s 719,000 Twitter and Facebook followers. In comparison, Under Armour spends less than $4 million annually on the NBA’s Stephen Curry (just $0.60 for each of Golden State Warrior’s 6.6 million Twitter and Facebook followers). Adidas spends $7.6 million a year on the UCLA football team, a whopping $41 for each of the team’s 184,000 Twitter and Facebook followers. In comparison, Adidas spends more than $14 million a year on Chicago Bulls star Derrick Rose (just $1.16 for each of his 12 million Twitter and Facebook followers). “While Nike spends more sponsorship dollars for pro teams and athletes overall, it’s paying a social premium for socially engaged college football fans,” says Martin. The demographic makeup of their fan base has a large portion of 18- to-22-year-old Millennials, but Martin points out it extends beyond the 34-year old Millennial cutoff point to include alumni, staff, and others. Apparel brands are especially keen on bringing the same level of preference for their brands to Millennials as they’ve secured among Gen X, Gen Y and other demographics, she added. Under Armour’s relationship with the University of Maryland, described in a recent New York Times article, is a prime example of this desire. Remarkably, ADI analysis uncovered the business trend that brands are tending to pay a premium for college-level relationships. ADI discovered that Nike, Under Armour, and Adidas are paying a premium (24x) for college-team sponsorships—all for access to amateur college athletes in hopes of signing them later if they go professional especially as a top ten NFL draft pick. The success on the field of a player and his potential social clout as a professional athlete can drive huge sales and brand loyalty for marketers feels Martin. Nick Saban, Jim Harbaugh and Urban Myers Social Buzz. Outside of Alabama, Nick Saban is the most hated coach as 63% of his social buzz relates to Sadness or Disgust. Yet, inside the state, 61% of fans queried in this ADI report expressed Joy, Admiration or Anticipation about the successful Head Coach during the College Football Playoff and BCS championship games. Michigan’ s Jim Harbaugh generated 41% of buzz related to Sadness and Disgust in the state of California where he is the former San Francisco 49er’s Head Coach while in Michigan, his name is surrounded by 65% positive Joy, Admiration or Anticipation. Urban Myers is the defending National Champion Head Coach at the Ohio State University and generated 71% positive social buzz in-state but is responsible for 50% of the negative social mentions coming Florida where he formally coached. In our Sports Techie blog about NFL social buzz, we discussed the notion that negative goes viral much quicker and wider spread than most positive stories over social media. Consider Presidential candidate Donald Trump as a good example on how to use negative political campaigning to his advantage because it unfortunately works in America. Thus, it is not much of a surprise that the negativity surrounding Saban, Harbaugh and Myers carries more far more weight to marketers than it really should in a positive, glass half full world. Three OSU players are in the top five of college football player Heisman trophy related social mentions with running back Ezekiel Elliot leading the way followed by TCU quarterback Trevone Boykin. Buckeyes QB Cardale Jones is ranked third and was released from the hospital last night after a headache scare which most likely led to a spike in his mentions. Georgia fans around the here should know that Nick Chub is not only ready to replace Todd Gurley in the backfield for the Bulldogs but he stand fifth in Heisman social mentions as a starter for the very first time. USC QB Cody Kessler rounds out the even mix of three qb’s and three rb’s in the top six socially mentioned college football players. Martin said Arizona linebacker Scobby Wright (although he was injured last night) and Utah star RB, Devantae Booker, are a couple of other top players to keep your virtual social eye on. Sports Techie, Breaking down these numbers helps us understand the passion college football fans have when compared to the professional sports team fan relationships. Social following in college football does lag behind the NBA and NFL but are closing in on MLB, said Martin. The Adobe social platform is certainly not perfect but it is comprehensive social data. I asked him about Snapchat and Vine and why those numbers are missing when the discussion involves Millennial aged fans that constantly use smartphone, send text messages and use video. He said Snapchat does not have an open API for scraping and tracking purposes. We then discussed Periscope and Meerkat as additional app tools younger fans love and marketers need to pay attention to because of its relevance to sports. Martin said Pac-12 teams streamed live Periscope videos of drills during fall camps, weight lifting session and provide inside looks much like the HBO Hardknocks show does with the NFL. The SMB market up to Fortune 500 corporations can benefit from analytics provided by Adobe Social and other tools that do not just involve tracking brands but adds valuable insight with regards to sponsoring, such as Martin’s hypothesis about paying a premium for college fans over pro fans. Social data is more than just mentions, it also consists of emotions and international elements. One thing I would add for consideration to these impressive insights are the amount of fake social media accounts that are all over the Internet. It is alarming to know that we can have one bank account, driver’s license number and vote but Twitter does little to combat the amount of fake handles as does LinkedIn. Facebook regulates this issue the best since one account is all they legally allow per person. Many marketing companies sell fake followers that obviously can skew social follower totals so be aware. Martin feels the trend towards granting digital rights access to international markets makes good sense. Why not do that with your brand, new fall TV new shows are now being made available outside the country and so should collegiate sports content, apparel and products. Under Armour has certainly cornered the market on undervalued endorsements when considering two-time 2015 golf major winner golfer Jordan Spieth, the reigning NBA MVP Mr. Curry and Notre Dame football are all part of their portfolio. The Irish teamed up with Showtime for a season-long television series after already signing up with NBC Sports as a broadcast partner. If you are searching for a big audience consisting of millennials, gen X and gen Y that follows college teams on and off the field while buying apparel in stores, college football is your sport. Knowing the social clout of each team allows marketers to recognize who you want to pair with. And there is no shortage of brands pursuing the opportunities, says Martin. Make it a social college football weekend.